From today, existing Sage One customers can sign in to their accounts or payroll service using their Facebook login details and non-users can quickly sign up for a free 30 day trial so they can take a closer look. (This follows on from the Google integration we added in March 2014 and is all part of our drive to make it quicker and easier for businesses to manage their finances online using Sage One). It’s a simple change but one that we think people will like as they now have 3 different ways to sign in or up to Sage One; via their Google account, Facebook account or directly with Sage One. 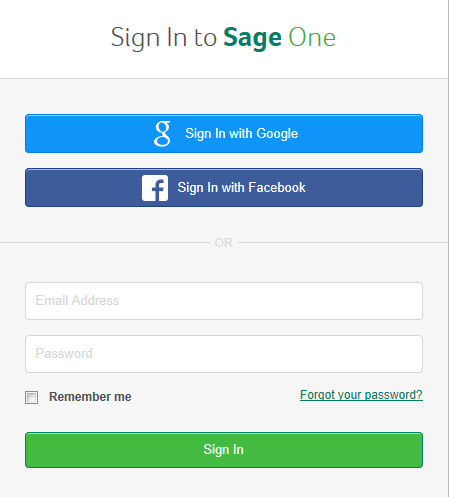 The Sign In page for Sage One at https://app.sageone.com/login now looks like this screenshot below. 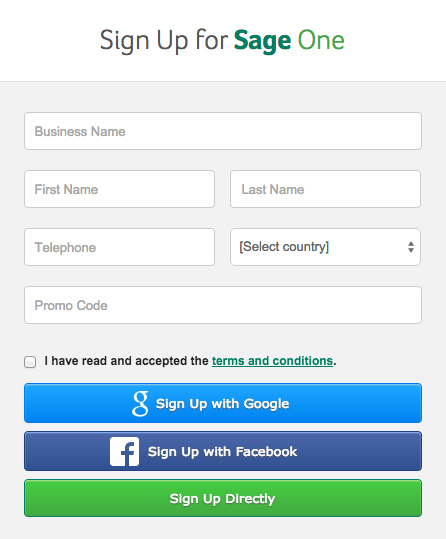 We have slightly different sign up pages for each of our products but you can see the new Sign Up page for Sage One Accounts in the screenshot below and at https://app.sageone.com/signup?product=accounts.